Among the important characteristics of the user-pay principle is that only those who use the service or facility will pay for its construction and maintenance while the rest of the population -- who won’t use them -- will be spared of such cost. This characteristic is embedded in the public-private partnership (PPP) mode of construction, procurement, and maintenance of big infrastructure projects. In contrast, projects that are funded through the annual general appropriations act (GAA) and official development assistance (ODA) are under all-taxpayers-pay principle. More specifically, GAA are paid by current taxpayers while ODA are to be paid by future taxpayers. Last month, the government through the Department of Transportation (DoTr) and Civil Aviation Authority of the Philippines (CAAP) has terminated the PPP mode of Development, Operations and Maintenance for five regional airport projects -- New Bohol [Panglao], Davao, Iloilo, Laguindingan and Bacolod-Silay. These five projects are projected to have a total cost of P108 billion. There are other projects that suffered from policy reversals from PPP to ODA-funding, like the Kaliwa Dam project in Quezon, and the PNR South Railway project. 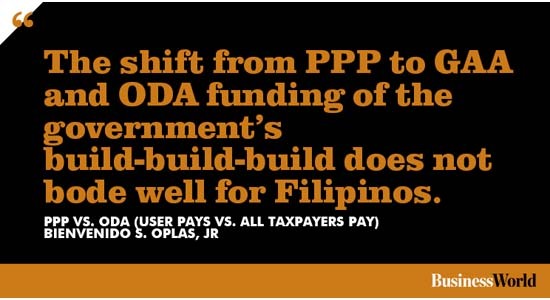 Since late 2016, the Duterte administration has announced that it will avoid PPP modes whenever possible and shift to government funding via GAA or ODA or a mixture of both. The reason given is that it will be faster and cheaper to build via government funding. This will cover mostly the P8-trillion infrastructure programs then auction off the operation and maintenance (O&M) contracts to the private sector. 1. PNR North Railway (Manila-Clark), Q4 2017 -- Q4 2021, P255B. 2. PNR South Railway (Manila-Bicol), Q3 2018 -- 2021, P270B. 3. Mega-Manila subway (Phase 1, QC-Taguig), Q4 2019 -- 2024, P225B. 4. Edsa-Central Corridor Bus Rapid Transit BRT, Q1 2019 -- Q1 2021, P38B. Now the basic question -- is it true that GAA or ODA-funded are more efficient, faster, and cheaper to build, than PPP-funded projects? In the same BusinessWorld Economic Forum last May 19, one of the speakers was Oliver Tan, Chief Financial Officer of Megawide Construction Corp. He showed two tables comparing the construction of two airports in the Visayas, the New Iloilo and expanded Mactan-Cebu airports (see table). Mactan Cebu airport terminal -- whose awarding was delayed for 18 months but will still be completed on time -- is almost five times the size of the New Iloilo airport and yet construction time is almost half that of the latter. The Cebu airport serves 17 international destinations, 27 domestic destinations, by 20 partner airlines. When this new terminal is finished middle of 2018, passengers are projected to enjoy these benefits: check in time will be reduced from 10.5 minutes to 6.85 minutes; getting luggage from 11 to 6.5 minutes; while retail outlets will rise from 17 to 28 and dining options from 17 to 31. From this example alone, it is NOT true that burdening all taxpayers with government-implemented infra projects is more beneficial to the public. There are inherent problems and risks to the public if GAA- and ODA-funding become the dominant mode in building important infrastructure projects. One, a government administration is short term, limited to only six years term and thus, it has little political or corporate brand to build and protect, it can worry less of what the people would say after its term has ended especially if the project is later discovered to be of inferior quality and tainted with corruption. In contrast, a corporation has a brand to protect and it would not risk this brand that has been built for decades to be tainted with corruption and wastes. Two, ODA funding normally have tight strings attached, like a China-ODA would mean only Chinese contractors, suppliers, managers, and even workers would do the work. Local firms would be relegated to O&M and their purchase of equipment and supplies might be constrained by the project specifications so that they will be forced to source these from China again. Three, there are recently finished and ongoing PPP projects that are yielding positive results, like the Mactan-Cebu Airport terminal building, NAIA Expressway, Tarlac-Pangasinan-La Union Expressway (TPLEx), school buildings, and automated fare collection system for the trains. These gains cannot simply be dismissed as inferior to government-promised better infra, especially under the environment of bad governance culture in the country. Four, the user-pay principle means that a tollway or an airport in northern Luzon will be paid only by those who frequently use those facilities. So the people and taxpayers in southern Luzon, Visayas, and Mindanao who seldom or do not use these facilities will be spared of servicing the cost of construction and O&M. The shift from PPP to GAA and ODA funding of the build-build-build plan of Dutertenomics does not bode well for Filipinos. Bienvenido S. Oplas, Jr. is the head of Minimal Government Thinkers and a Fellow of SEANET, both members of Economic Freedom Network (EFN) Asia.